ChibiStudio is a fun and exciting app which lets you create cute chibi characters with the help of your friends, all of this within iMessage. With over 1000 options (and counting) for eyes, hair, mouth, clothing, shoes, and more, the possibilities are endless. Save these cute chibi characters as stickers and unleash the cuteness of these kawaii chibis anytime you want. Maybe you'd like to create an anime character to represent yourself. You want to have a set of manga faces stickers that are completely unique; no one else on the planet will have your own chibi stickers. 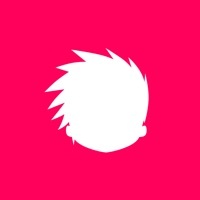 ChibiStudio helps you achieve this by making it very easy to create a character and use it as stickers across your iOS devices. 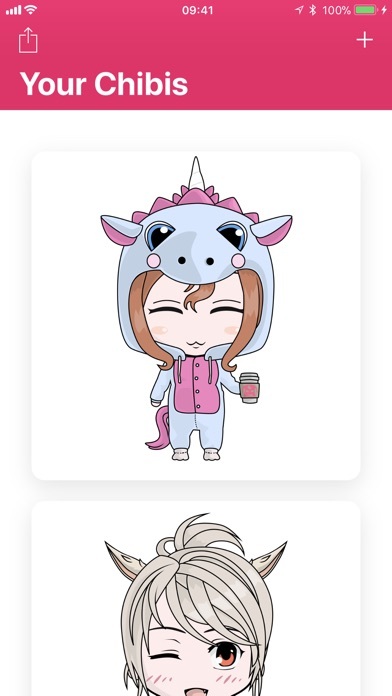 Share the fun: send these chibis and collaborate with your friends on iMessage for cuteness overload. Both of you can add and remove customizations. There is no other avatar creator or chibi maker application that provides this feature on the App Store. Here is how you create a character with ChibiStudio, the best avatar creator on iOS: Pick a chibi character and customize it anyway you want. If you want to, you can collaborate with your friends on iMessage. Both of you can customize the cute chibi by adding, removing or customizing the anime character. Customize his or her cute manga face such as eyes mouth, hair, and more. You can also customize his or her clothing, shoes, accessories, and other elements! Choose from over 500 options, 200 of which are free! Save your chibi avatar as stickers and use them whenever you want. Easy, isn’t it? 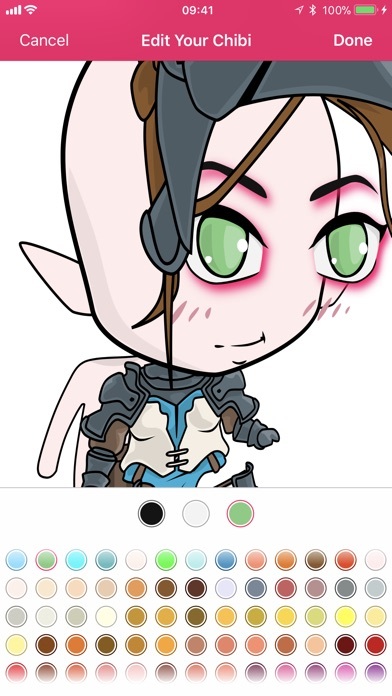 This avatar creator app also stores your chibi characters on iCloud so they're are available on all of your iOS devices. So cool! If you have a dream of becoming a manga artist and create your own Japanese characters and manga faces, this is your chance to make your dreams come true. You don’t have to be a top artist to create unique and cute chibi characters the way you want them to be. With 500+ options, there are endless possibilities and combinations. The sky is the limit. Create your signature kawaii chibi characters and share them with your friends to impress them. They’ll be amazed at your creativity and they will want to join in the fun! ------ Visit our website: getchibistudio.com for more inspiration and information. We are constantly improving our app. If you have any problem with using ChibiStudio, please don’t hesitate to contact us via email. We’ll resolve your issue as soon as possible. If you like this anime avatar creator, please show your support to us by leaving us a rating and review! I would give it three stars but it needs some improvement. Number one is at first I thought you could not change the skin color. You should make it more easier and more obvious of how you do it it would make more people want to play it. Maybe something should pop up to tell you how do you do the importance of the app. because somethings are confusing like how do you change the outfits without all of it coming off. because at first if you’re trying on a lot of the outfits you don’t know that you have to tap it to get it off so I didn’t know that so maybe you have like to Tutorial or something else like that. One more thing is with premium all the cool things are in that package. My mom is not going to let me get it, so I can’t use the stuff that is premium. I don’t think you should get the premium version. There are all different types of packages for money. So overall it needs improvement. This game seems pretty cool and when I’m bored it’s fun to just dress up characters, and it actually has some really cool things Just let me know when it will update. ID LOVE TO SEE NEW THINGS IN HERE! The hairstyles? Diverse. Lots of textures and styles. You get one color with that style, though, and you better like it. Clothes? Wide array, but again, no color changes. And I hope you like three expressions of mouths because that’s what you get. Shocked, smiling, straightfaced. And half the eyes are just one side green and the other blue. And, of course, the base is always a white person. Sorry if you want to make any character beyond an average pale person. I love this app because I love chibi and anime. One thing I hate is how you have to buy almost everything. So overall i give this a GOOD. This game is so amazing because you make your own characters and it’s 2 in one gatcha and anime thank you for making this game! This game is soo fun! I play it everyday now. You get to make your own characters and send them to your friends and others! I don’t like how limited it is. 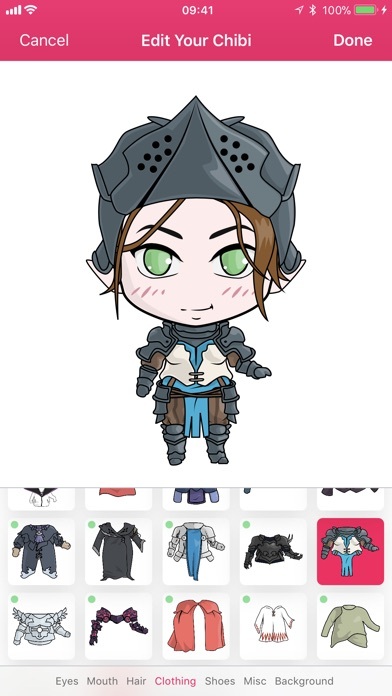 Like if u wanted to make chibis with More verity then I would need to buy an upgrade. And I understand with these types of games you have to make some sort of profit and I agree. Other that there is so much you got to buy, I genuinely like the game. Chibes are so cute I love this app just you have to pay a lot! The Chibi Faces Are Cute And Adorable! Even the Premium Packs!!! All together it’s a really good game. But most of the really cool stuff you have to have to pay for. But I really do like this game. I use it all the time. I just got on this game five minutes ago and I love it so much but the only thing is can you change the skin tone? It’s a fun game and is really interesting to see all the different things you can do! I looooooooooooove getting to create chibis! Although there is a ‘Premium’ purchase in ChibiStudio, it doesn’t bother me much because there’s only extra clothes and such. Don’t get me wrong, I love the clothes, and wish they weren’t premium, but I have enough options for chibis as it is. There are no ads, as far as I can tell, and overall, this is a great game and I recommend it to anyone who loves designs or dress-up. This is also a great way for me to design characters, as a writer. I just wish that we could change the colors on the clothes, that would be VERY helpful. I was also hoping you could add the ability to give them names. That would be helpful also. I hope you liked these suggestions and consider putting them into ChibiStudio. I love the game and everything in it. This game is fun and all but I realized that this was a rip-off of gacha life. I hate how they took gachas idea away I’m actually kind of mad that they did that. I love gacha life but they took it away. I hate that. And you need to buy some stuff in premium. With your own money and not diamonds like gacha life. Pls change the idea and I will give more stars. Best app ever to have! Omg! !my life has a big smile smack dab in the middle!! I play this everyday for my text messages!!😋Thanos! It was good but it needs some perfecting and when I tried to make a character it took its head away and idk how to get it’s head on and how do u delete stuff like the characters or else I’ll delete something like the app!! But... one improvement. I love this game and I’ve made like four hundred Chibis, but there’s room for improvement. Okay this first thing is VERY important, and simple to do, and I think you should really consider is and it would probably improve ur amount of players. You NEED to explain how to change skin color in the opening info thing. I’ve seen countless complaints of people angry about being all Caucasian and I don’t think they all know about changing clothes and skin colors. Now this is just other stuff now. I wish maybe you could add patterns? Also, I would like it if you could do it so we could watch an add to use a locked piece. It did that for awhile, but went away? And then, just out of curiosity, what is the point of the black chunky-things that cover the whole body, and the weird black underwear stuff? Please respond, or at least consider some of it. Great game overall!